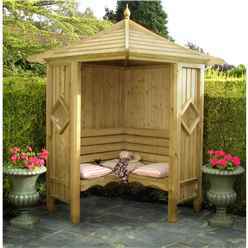 High grade slow grown timber, 4’ x 4’ wooden corner arbour, ideal accessory for all gardens seating two people with a perfect place to relax and also includes a full fixing kit and instructions manual. The 4ft x 4ft Wooden Corner Arbour is a charming accessory for any garden. Seats two people and is ideal for relaxed evenings and day times.